This building is too interesting just to have a few postcards on the site! 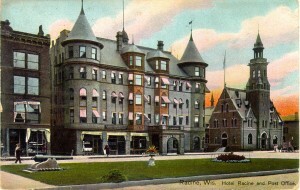 The first Hotel Racine was built in 1893 and torn down in 1925. 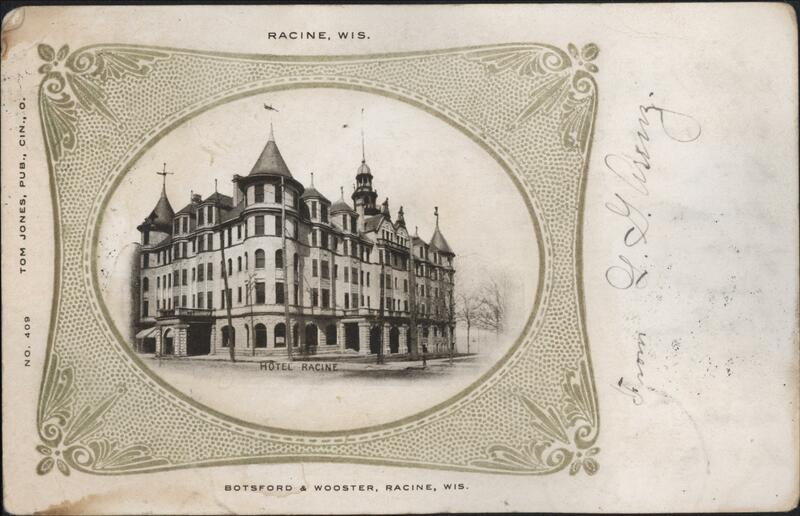 Here is a short biography of a Hotel Racine manager, George Hopper. 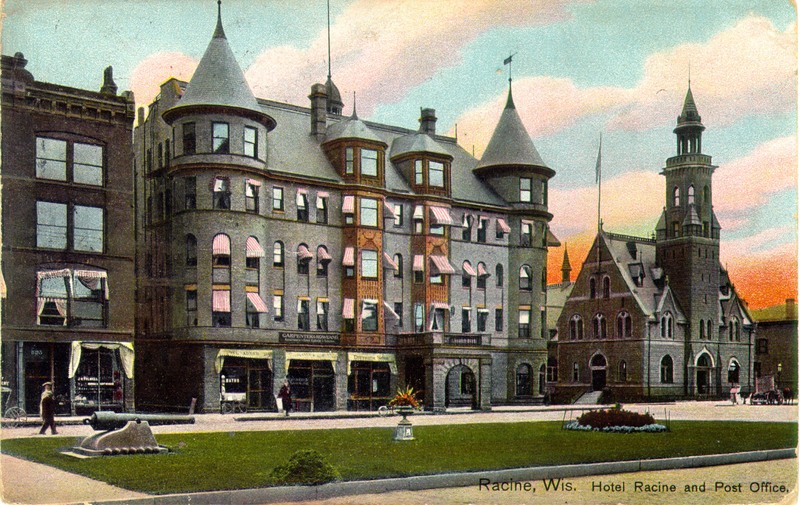 I found this very vivid account of a society ball at the Hotel Racine on January 2, 1895. “Is this Racine?” exclaims the visitor as he walks up Main street and gazes at the electric cars whizzing past. Farther on a magnificent structure of stone and brick meets his eye and still he wonders if this is the Racine of five years ago. 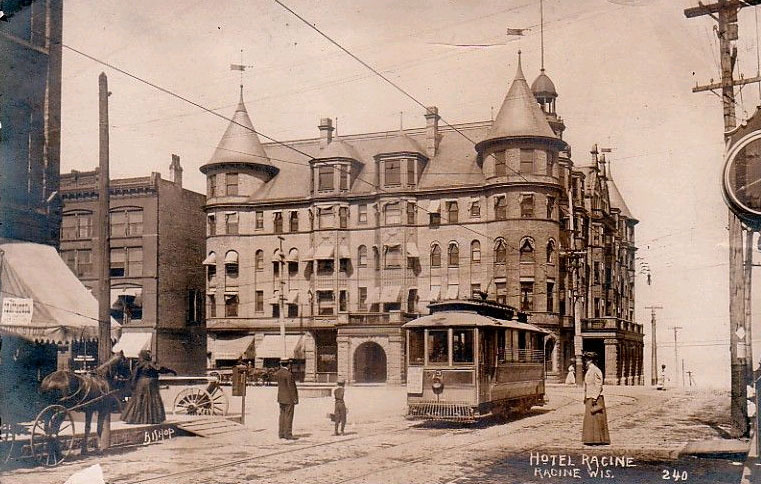 This is the Hotel Racine and the building is certainly a credit to the city; to the gentleman whose enterprise so successfully brought the plan to completion; to the architects, to the contractor and the able officers who have managed the affairs of the hotel association. 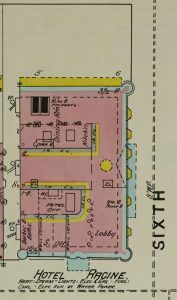 Today the Journal presents a cut of the hotel, showing the Sixth street front. It was taken from a recent photograph by Billings and it is a splendid likeness, though not showing the building complete. Within two weeks the hotel will be finished and ready to turn over to the directors. Hugh Edwards, the contractor, has performed his part of the work to the satisfaction of all who had an interest in the building. From the picture a view of the outside appearance can be obtained, but the visitor should open the massive doors and take a look upon the inside if he desires to see one of the best modern hotels in the country. The handsome office, lobby, corridors and lounging rooms, finished in quarter sawn oak, with marble floors, are indeed inviting. 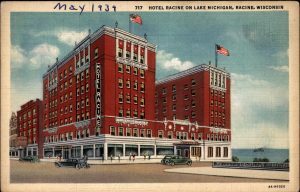 But the crowning feature of the hotel is the spacious dining room, with its lofty ceiling and magnificent view of blue Lake Michigan. From the large windows you can see the light house at North Point, and the harbor studded with vessels of every description; then turning to the south the smoke from the factories at Kenosha meets your vision. Stepping out onto the verandah’s, which rise tier above tier on the southside, you find one of those ideal spots to spend a summer’s afternoon when the mercury hovers about the nineties. The spacious rooms inside are arranged singly or en suite. There is not a dark room in the hotel and nearly every one over looks the lake and the city. No mere writing can give the hotel its just praise; it must be tried and it will not be found wanting. Dr. John M. Marshall, former proprietor of the Hotel Racine, died on the evening of November 19, at his home on Brookside avenue, Redlands, California. Mr. Marshall was one of the most successful hotel men in the country, and when he had charge of the Hotel Racine he conducted it in a first class and business like manner, and sold out at a profit of about $8,000. He was a man upright and honorable in every transaction, and with the guests of the house was popular, never losing an opportunity to make them comfortable. He sold the hotel here to Mr. Solloway and went to Richmond, Indiana, where he conducted a hotel; thence to Butte, Montana, and came back east again. Last spring he went to Redlands, where he bought the Rev. D. H. Gillan ranch and residence at Brookside, expecting to make that his home. With Mrs. Marshall he spent last summer in Europe and returned to Redlands late last September. Soon after he was taken ill and his decline was rapid. Dr. Marshall was a native of Ohio, and at the time of his demise was 64 years of age. 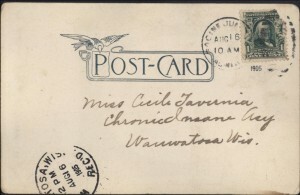 Deceased is survived by Mrs. Marshall and two daughters, Mrs. S. B. Williams of Nashville, Tenn., and Mrs. W. S. Longford of Atlanta. Ga.
Look at this building I saw in Dallas! I was taking a cab from the airport to the convention center and all of a sudden, I thought I was dreaming — it looks just like the first Hotel Racine, right down to the different stone used in the first story. Apparently it is called the Old Red Courthouse. 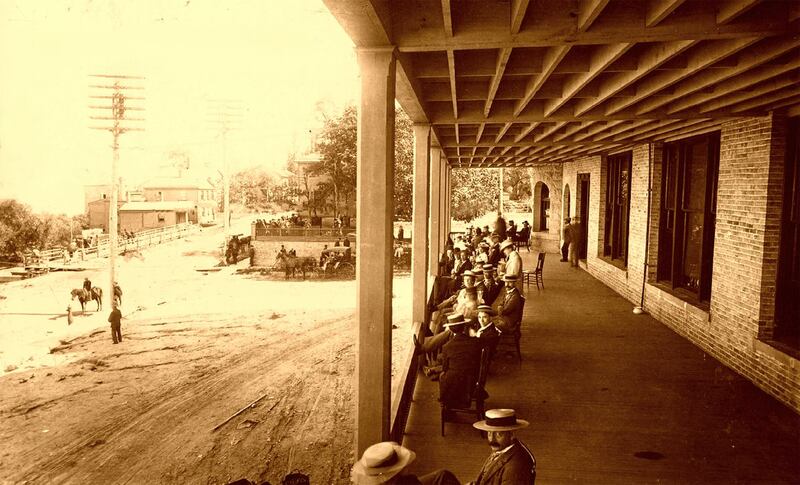 Dennis Tully: This view looking South, is the “Lake Avenue Side” of the first Racine Hotel in the late 1800’s. 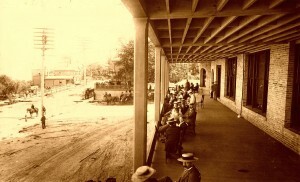 There was a large porch for the hotel guests with a view of Lake Michigan (far left). The stone wall left of center runs along the South side of 6th St. (now the parking area in the rear of the Post Office Building). 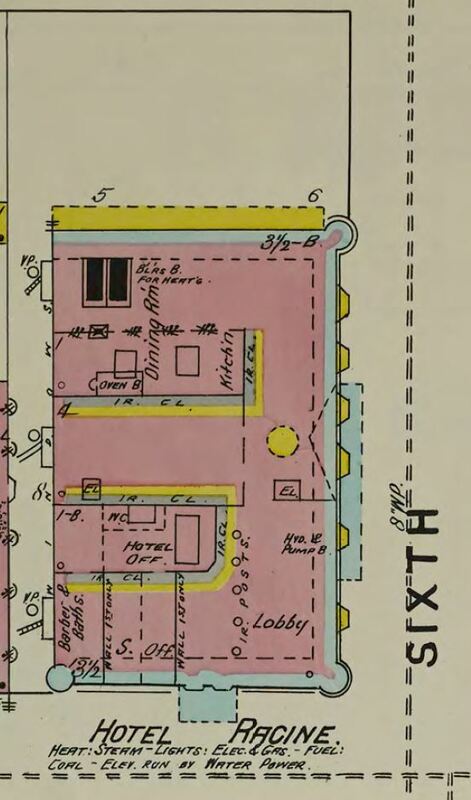 The buildings at upper left would be about the present location of Memorial Hall. The building behind the nearest post would be the location of McMynn School. It appears by the gathering of people in the background that there was some activity going on across Lake Avenue towards the lake. The back of this photo says barber shop in Hotel Racine. Typical barber shop of the time. Probably early 1900teens. Spittoons on the floor. Embossed tin metal ceiling panels. Could be gas or electric ceiling light fixtures . 25 cents might have been the price of a haircut. 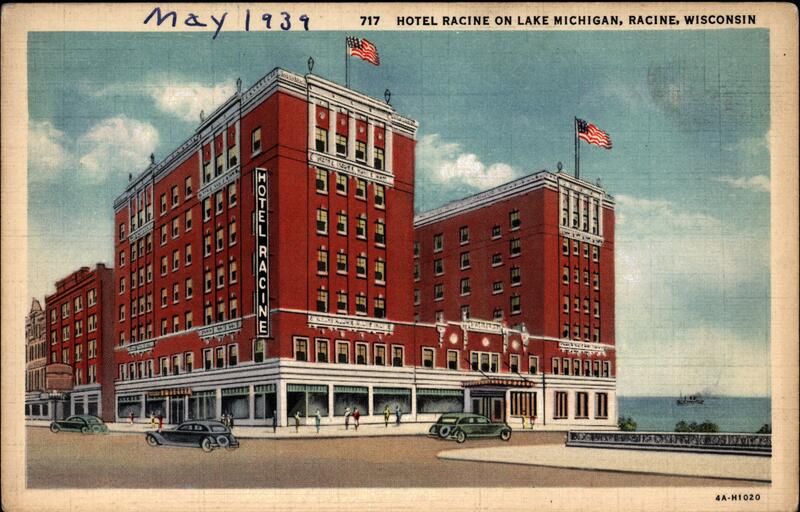 The second Hotel Racine was built after the first Hotel Racine was torn down in 1925. 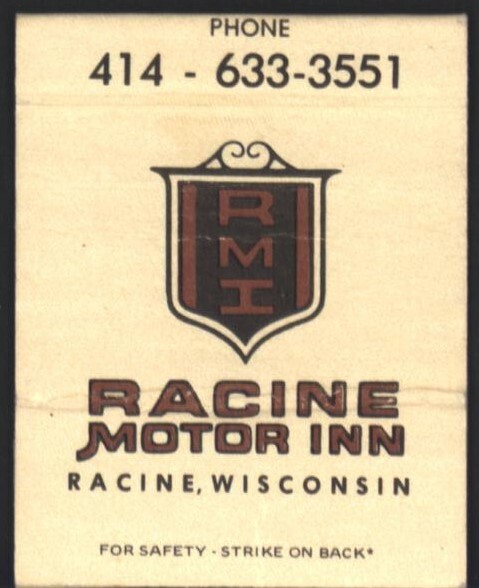 I was a bartender at the Hotel Racine, around 1962, when one evening Glenway Wescott and Gilbert Seldes walked in and sat at a booth. 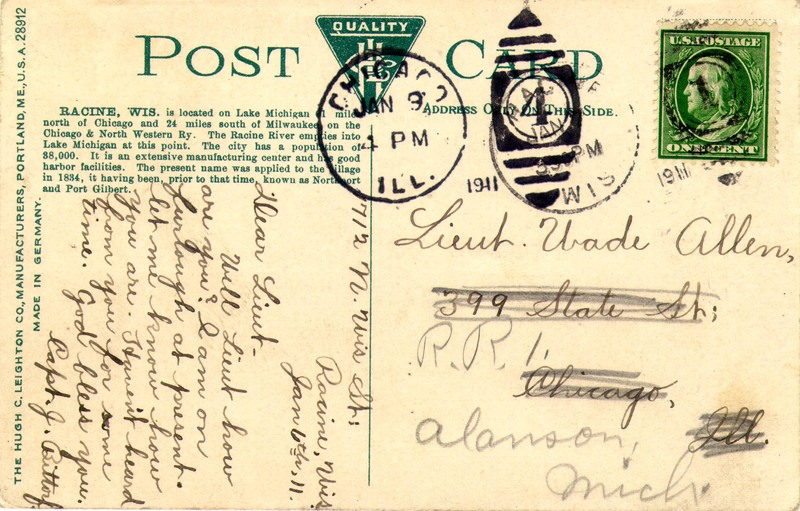 Glenway Wescott was Wisconsin’s most famous (and best) living writer, and at that time I had written very little—a few stories, a poem or two—still unpublished but determined to become a writer. After I recognized him they came at sat at the bar so we could talk. 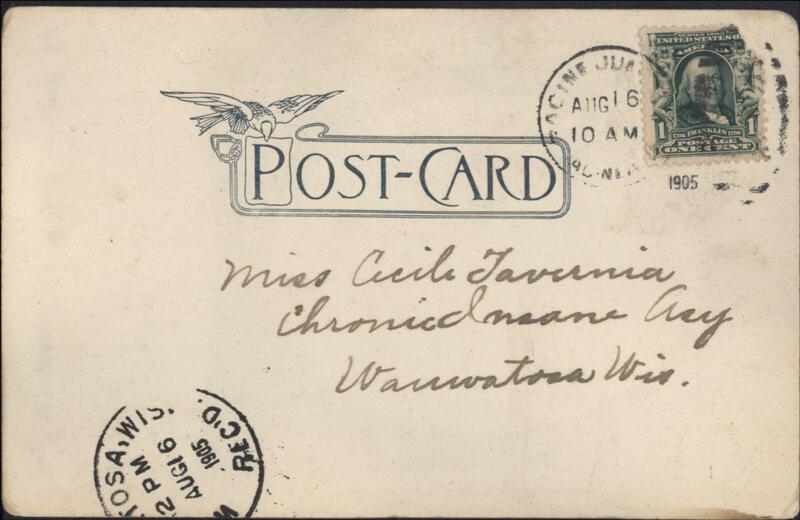 A correspondence would ensue and GW later came to see me at the bookstore I was working at in San Francisco. 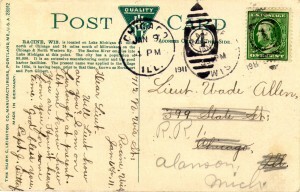 At that time there was no grander place in Racine to drink, eat, and converse—and meet famous writers. I appreciate the interest and efforts Todd Wallace and others have invested in the history of Racine. They have encouraged me to read more and more history about the U.S. Europe is older but we have fascinating artifacts and stories here as well. Thanks so much. 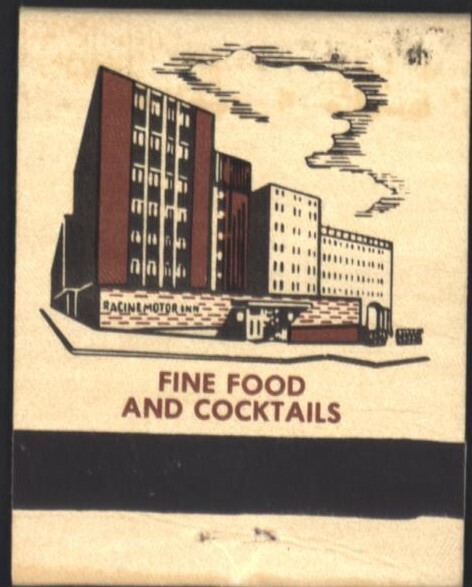 Does anyone remember the Mandalay Lounge in the old Racine Hotel. there was a xylophone player there by the name of Kerry Wahls. Very talented guy.